Blaze Media Pro is a full-featured audio and video editor and converter for all media files. It is developed by Mystik Media. Editor: Blaze Media Pro enables to edit most popular audio and video formats. For these two kinds of media files, this program can crop, delete frame, resize, rotate, trim and adjust audio volume and even more. For video editing, adding effects and filters are at users' disposal. Convertor: converting bit rate and compression for audio formats is possible with Blaze Media Pro. All popular formats are supported. Note that even protected AAC and M4P files can be easily converted. Audio recorder: from line-in, streaming audio or other sources, Blaze Media Pro can record audio and save the output in different formats. For instance, we can cite MP3, OGG, WAV, WMA and many others. 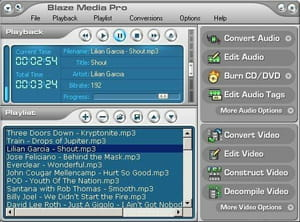 CD/DVD burner: Blaze Media Pro can be used as a CD/DVD burner. Thanks to this, another burner is no longer needed after editing and conversion. The output can be played with all players. The interface is well-designed and configurable. It can create a video from still images. This trial version expires after 15 days of use. Latest update on February 8, 2015 at 05:43 AM.